Legion Vice President Sean Cuppens (center) and Sgt of Arms Kevin Rozema (on right) present Carrie Presley from the Leduc Girl Guides with a donation to the organization. 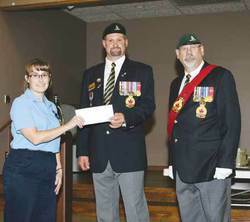 Donations were also made the same evening to the Leduc 1st and 2nd Scouting troupes. Reverend Joanne Webster (First Picture) is officially installed and welcomed by Leduc Legion representatives as their new Chaplain.